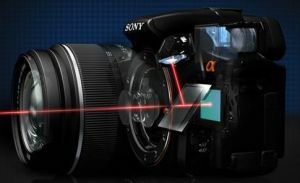 Sony A77's OLED viewfinder - made by Samsung using new technology? Update 2: It's official - the OLED microdisplay is made by Sony. Update: We got this rumor confirmed by a trusted source. We just got an interesting rumor sent to us by an anonymous tipper. Remember Sony's A77 OLED viewfinder? Our tipper says that the microdisplay is made by Samsung. Samsung is using a "laser based technology" and not FMM (see more on Samsung's upcoming move to LITI here). Samsung is also using "new organic colors". The display itself is 0.9" in size and has a 4:3 format. According to earlier reports the resolution is XGA (1024x768). not likely...if so, who can explain why samsuang still use PenTile Matrix on the Super AMOLED HD display? Rumors: Sony to include an OLED viewfinder in upcoming DSLR cameras? Sony's NEX-7 to have an OLED viewfinder too?